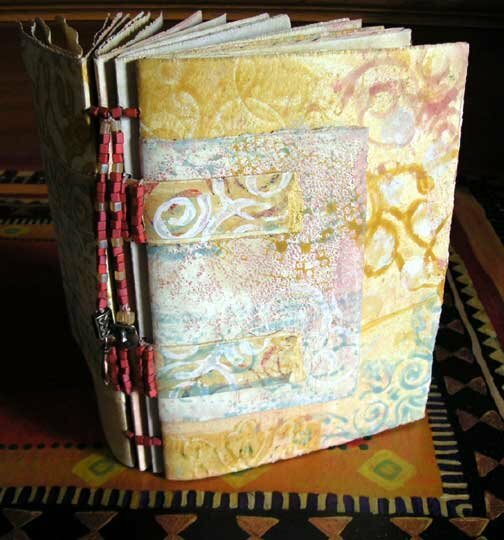 This is a book I made at Artfest in a class taught by Albie Smith. Why blog? Well, because it is the easiest way to share my art investigations with my friends who live far away. That is the main reason. My tribe of friends keeps expanding wider and wider. We no longer live within driving distance; posting to a blog is a way of sharing with my friends in distant states and countries. My hope is that I can post a small bit a chat each day and a photograph of what is in my studio. I have no idea how to work the technical parts of this yet so no doubt I will learn as I go. No one knows I am here yet so that is good. I like to fall on my face when no one is watching; then I can pretend I am perfect. I have a saying that I love (and probably plagiarized from someone so don't sue me) and so I will start with that. It is, "Often wrong but never in doubt". That is me. And this is my story. oh, i'm so glad you started a blog. i am such a fan of your work. and of course, artfest was incrdedible. amazing. I have another option for you, as far as a way to get along in the world where being perfect seems a bit of a reach for most of us. This bit of guidance is from a business professor of some note named Karl Weick, describing how he deals with the issue of presenting his own viewpoint without ignoring that of others: "Argue as if I'm right, and listen as if I'm wrong." My single-favorite, "can't we all just get along??" quote! I'm a newbie reading your blog, but I already love your artwork after only minutes on your site.